We will understand, in this article, the flow of project deliverables. The entire flow of deliverables are explained step-by-step, outlining how the deliverables are produced, verified and accepted. any unique and verifiable product, result or capability to perform a service that is required to be produced to complete a process, phase or project. We create Project Deliverables in Direct and Manage Project Work process to meet the project work as planned and scheduled in the project management plan. 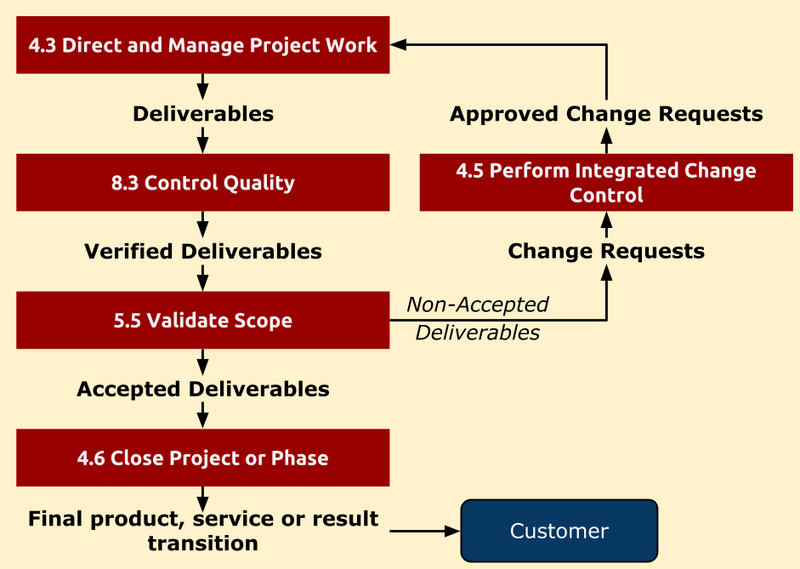 The deliverables, created in the Direct and Manage Project Work process, are verified in the Control Quality process to determine the correctness of deliverables. In this process, we are concerned with the correctness of the deliverables and meeting the quality requirements specified for the deliverables. Such verified deliverables from the Control Quality process becomes an input to Validate Scope process for formalized acceptance. In the Validate Scope process, we are interested in the acceptance of the verified deliverables. Deliverables that meet the acceptance criteria are formally approved and signed by customer or sponsor. Formal documentation acknowledging the acceptance of the project deliverables is forwarded to the Close Project or Phase. The completed deliverables that have not been formally accepted are documented along with the reasons for non-acceptance. These deliverables may require a change request (defect repair) that will be reviewed in the Perform Integrated Change Control process. Once the change requests are approved, the approved change requests become an input to the Direct and Manage Project Work process and the above cycle continues. Please note that Control Quality is generally performed ahead of the Validate Scope, but you may also perform the two processes in parallel.